Fine fish: The roasted cod wears a thick and bumpy blanket of toasted nuts, finely chopped and mixed into a chunky tomato and garlic sauce. In the 20-some years I’ve been walking into El Meson I’ve never not been greeted by José Alves. He’s been very much the man in charge of this rock steady Iberian restaurant for 25 years. So it was something of a shocker to find myself face to face with a kid last week. Not much else was off. The place looks the same — there’s been no stripping tables down to the veneer, no hauling up of carpet, no reclaimed modernist overhaul. The lunch menu seems largely unchanged, and I certainly recognized my server from years past. Looking around at the noontime clientele — a table of men in suits, a few of the New Edinburgh elegant elders — the crowd seemed ’bout right. But there is news at El Meson. Big news. José and Maria Alves retired last spring (and may I use this page to thank them and wish them all the very best). Lunch proved that the chef for some 16 years, Thomas Moore, was still in form. 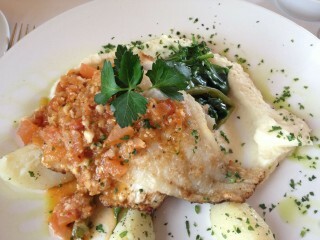 I chose the featured fish: roasted cod with almonds and pine nuts. The white fish came as a juicy filet timed to perfection such that it yielded with the barest touch of my fork. It wore a thick and bumpy blanket of toasted nuts, finely chopped and mixed into a chunky tomato and garlic sauce and it came with sides: turned and boiled potatoes, a silky purée of parsnip, roasted green beans and spinach. An accomplished dish from an accomplished restaurant entering its second quarter of life with some new faces. Buenas noches, José. Buenos dias, André. Cost: Pescado del dia, $18. Open: Monday to Friday for lunch; Monday to Saturday for dinner. El Meson, 94 Beechwood Ave., 613-744-8484.